Ministering to the community for over 100 years. Started in 1913 with 18 members and continuing to grow in faith and numbers each year. Beulah Cemetery had long been a community burial place when the idea for a church was conceived. Although ideas about when the brush arbor meetings began vary from 1909 to 1911, the church was organized on August 31, 1913 with eighteen (18) members. The first church building was also constructed in that year. It had kerosene lamps for light and a wood burning, pot-bellied stove for heat. Rev. John B. Simmons was the first pastor serving for twelve years. Meetings were held on the second and fourth Sundays of each month with Sunday School every Sunday. In 1930 Rev. J.W. Allen became pastor and served three times between then and 1942. He was also Sunday School Superintendent, adult teacher, choir leader, and deacon (as were most pastors of that time). In 1927 the church treasury had $2.00 and owed 25cents for a kerosene lamp. The first piano for the church was purchased in 1930 at a cost of $100. Since there was only $50 in the treasury, Rev. Allen paid the remainder until the church could reimburse him. The church had no deed to its land until 1938 when Tom Smith and Dave Purvis persuaded the Virginia Carolina Co., which had bought out the old Phosphate Mining Company, to give them one. In 1939 the church building was enlarged and a light plant was bought. In 1951 electric lights were purchased, the old light plant was sold and gas heaters were bought with the money. Full time services began in 1952 under the leadership of Rev. Charlie Gray. In 1961 the church voted to pay the pastor a salary rather than a percentage of the offerings as had been the custom. The present church auditorium was dedicated on August 30, 1953 at the 40th Homecoming services. A baptistery was added in 1960 and the Sunday School building in 1965. In 1972 restrooms, office and foyer were added to the front of the auditorium. The final building, the Fellowship Hall, was completed in 1978. Sound Room, food pantry and additional lighting to Fellowship Hall completed in 2006. The latest renovations were in December 2007 with new tile flooring in the foyer, Ladies and Men’s Restroom and the Sanctuary front wall being completed. Additionally two new projectors were given to the church and the sound system is continuing to be improved. We revamped the front ramp with a stone façade and benches. We began webcasting three services each week. We have been greatly commissioned by the Lord Jesus Christ that as we go (evangelism) throughout this Community, County, State, Nation and World we are to reach out to those separated from God by their sin (education), baptize those who have reconciled with God by faith in Jesus Christ into this Church family (fellowship) and teach them everything He has taught us through His Written Word (edification) into Christlike maturity (exaltation). 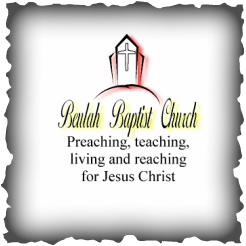 © by Beulah Baptist Church 2019.